green Earth. What is your secret? you gotta use a cast-iron skillet. No room for compromise there. two, three hundred bucks apiece! Can I just say, amen? If you've seen the episode of Buffy the Vampire Slayer that the above exchange comes from, then you know Ted turns out to actually be an evil robot with a habit of killing his wives and drugging his girlfriend's family and friends with ecstasy-infused chocolate chip cookies. But boy oh boy, can he cook! Before the discovery of Ted's non-human status and subsequent slayage, we get a charming little scene where Ted (played by the great John Ritter as both funny and mildly menacing), explains his pizza-making process to Xander and Willow. It sounds so fantastic I always catch my mouth watering a bit, even though I've seen the episode countless times and I know what's hidden in Ted's closet. I obviously dislike Ted and his creepy misogyny, but I have to confess I've always wanted to eat his mini pizzas. And now we all can! These pizzas are shockingly simple to make, even with the added step of frying after baking. 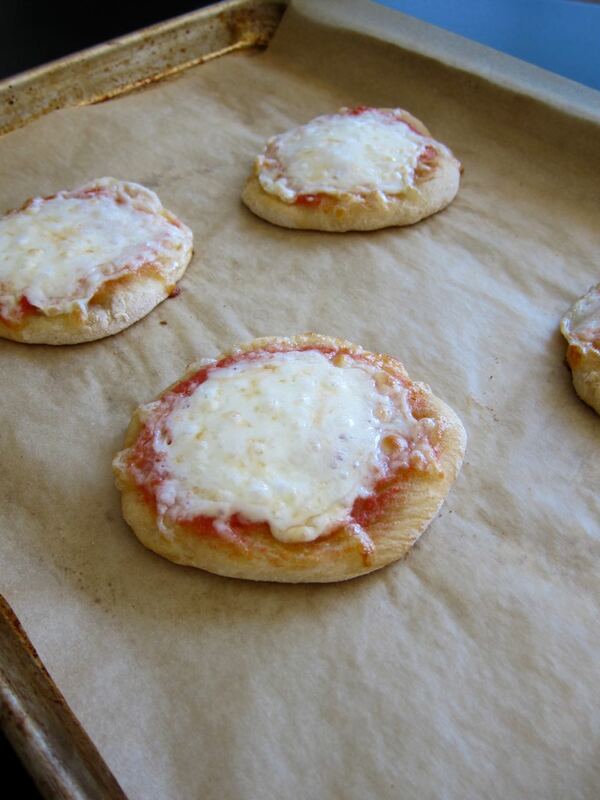 If you use store-bought dough and pre-shredded cheese, they are even easier. The only place I think you really shouldn't skimp is on the herbs. Fresh is best here, to really infuse the olive oil and lend flavor to the crusts. I also added garlic to the aromatics to ward off any vampires, but you could of course leave that out if you want to be faithful to Ted's original recipe. And don't forget the cast iron pan! There really is no room for compromise here. You want to have a heavy-bottomed skillet to evenly heat the oil so you get a nice, crispy crust on the bottom of these pizzas, and you know, it might come in handy when your Mom's dead ex-boyfriend reboots and attacks you in your kitchen. That last part probably won't happen but a slayer can never be too prepared. Heat your oven to its highest temperature and line two baking sheets with parchment. Divide your dough into 8 equal pieces and roll out into thin rounds. Place 4 rounds on each baking sheet. 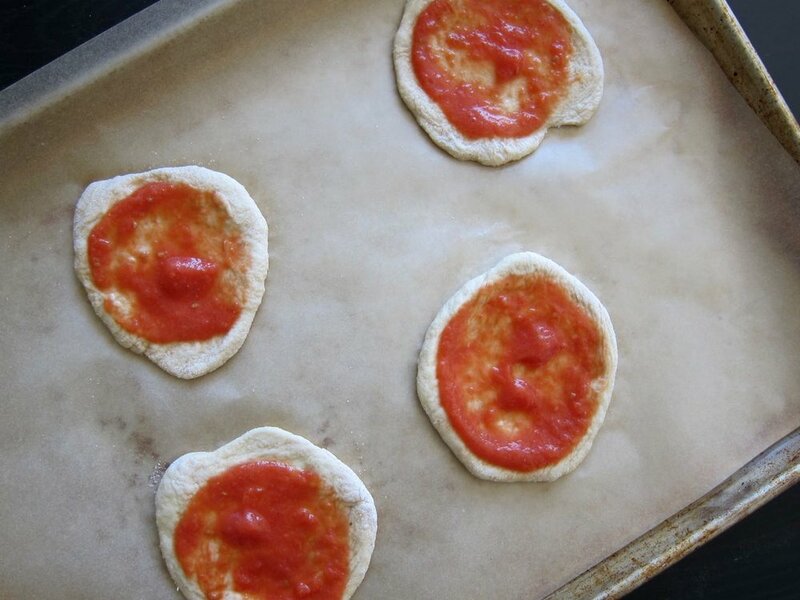 Mix crushed tomatoes with the salt and puree in a blender, then spread over the dough. Top with 1/8 cup cheese on each and bake 10-12 minutes, until cheese is melted and bubbly and dough is puffed and cooked through. While pizzas are baking, heat a bit of olive oil in a cast iron pan over medium-low heat, enough to cover the bottom of the skillet. Add the herbs and garlic and let infuse the oil. Lower the heat if the herbs and garlic start to burn. After the pizzas are done baking, raise the temperature under the skillet to medium. Fry the pizzas in the oil until bottoms are darkly golden, then drain on paper towels, garnish with basil if using, and serve hot.